Nendran chips is one of the popular snacks and these are fried in coconut oil and sprinkled with salt water. 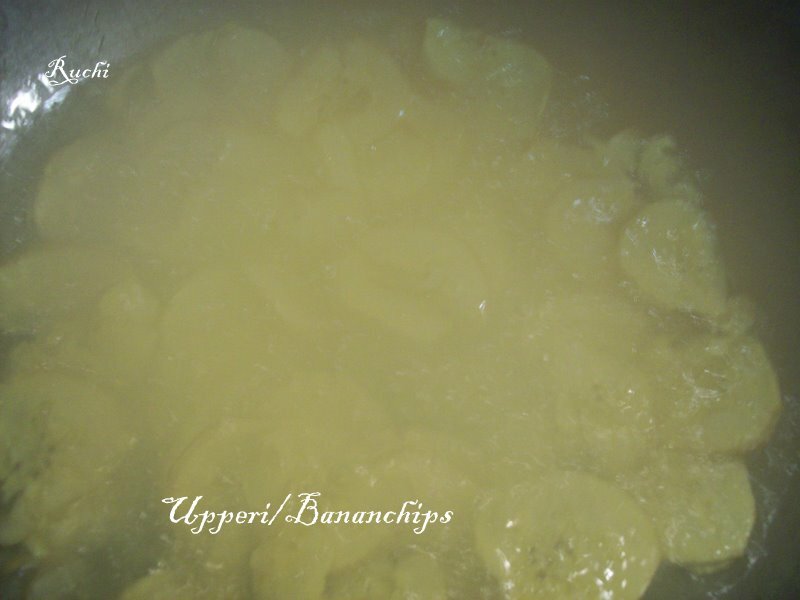 They are called "Upperi" They are an important item in festive occasions.. Both ripe and unripe bananas are used for this variant, sometimes they are coated with jaggery to form sweet variants. 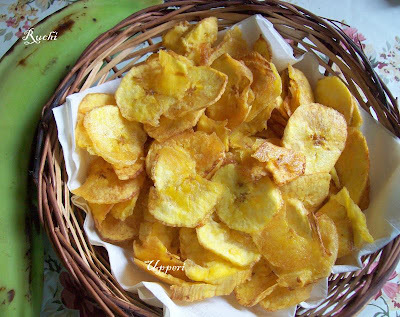 Whenever nendrankay available in market I prepare this chips at home. 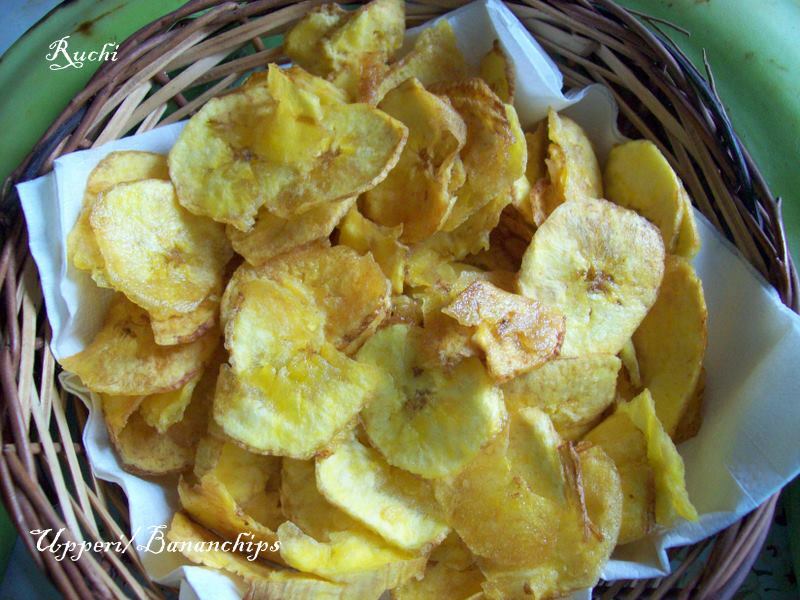 In my home everyone love this bananchips.. They tased heavenly! 1.Peel the outer skin of the bananas and immerse them in the turmeric water for 10-20 minutes. 2.Drain the excess water and leave to dry or pat dry with paper towels. 3.In a vessel add water and turmeric powder and keep aside. 4.Heat oil in a deep, wide mouthed pan at a medium high flame. 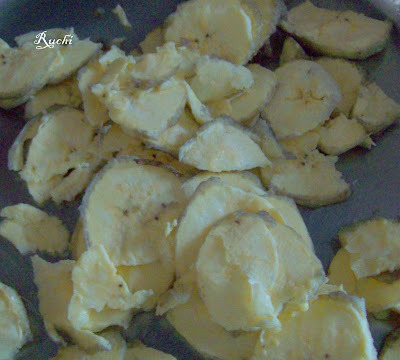 5.Slice Banana into thin round pieces and dry the sliced pieces in a plate lined with kitchen tissue or towel. 6.Slide the sliced bananas into hot oil without overcrowding them and occasionally give stir to flip them and keep them from sticking together. 7.When the chips are almost done you can hear a crisp sound and the oil will stop foaming, reduce the heat and sprinkle a little salt-turmeric water(you do not need to add more than 1-2 tsp) into the oil carefully. 8.After sprinkling since the oil might come up and splash making lots of bubbling noise. When the bubbles stop coming, stir well and fry for another 2 minutes or until golden brown and drain on to a colander. 9. Repeat the next batches and sprinkle less salt water for the next batches as the oil already contains some salt that you added before. Just now finished eating a serving of store bought :)Loved urs !